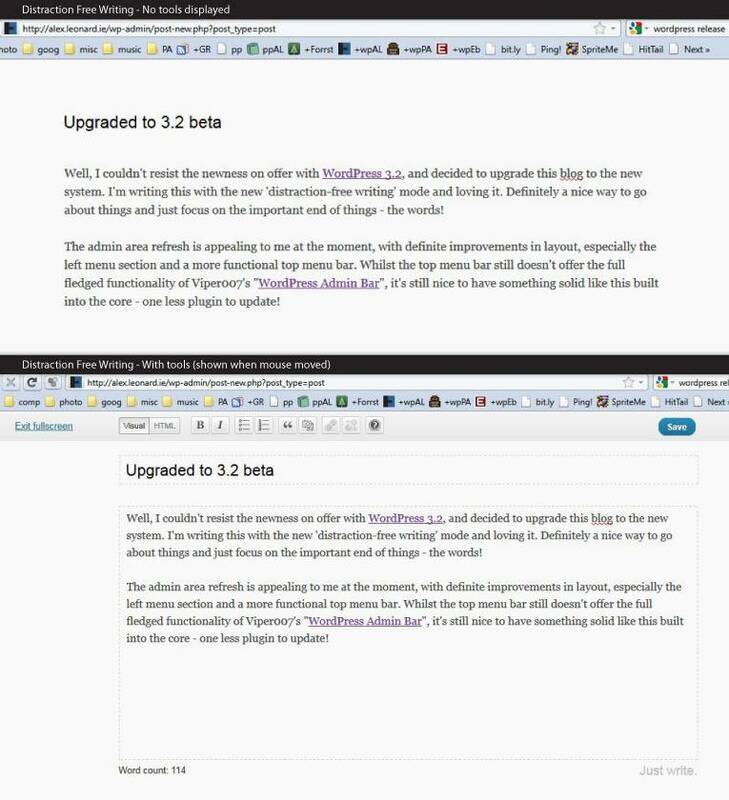 Well, I couldn’t resist the newness on offer with WordPress 3.2, and decided to upgrade this blog to the new system. I’m writing this with the new ‘distraction-free writing’ mode and loving it. Definitely a nice way to go about things and just focus on the important end of things – the words! As you can see from the image to the right (click to enlarge), the default mode just shows your post title and your text, nothing else. The font is very legible, the line-width is just right, and there is nothing which can distract you from writing. By moving the mouse you get a nice fade in on some various options. The tool bar at the top gives you options to save, exit full screen mode, and the important tool bar items such as bold, italic, lists, quotes, image insertion, and link insertion. You can also switch between visual editor and HTML editor mode. In addition the editor sections get lightly outlined with a dotted box and you get a shown a word count. The admin area refresh is appealing to me at the moment, with definite improvements in layout, especially the left menu section and a more functional top menu bar. Whilst the top menu bar still doesn’t offer the full-fledged functionality of Viper007’s “WordPress Admin Bar“, it’s still nice to have something solid like this built into the core – one less plugin to update! The collapsed version of the left menu is also extremely neat and occupies very little space. All of the various boxed elements around the admin area are sharper with a subtle gradient shine added and some extra definition between elements. The various post/page/link overview screens have also been given more definition and there’s increased contrast between alternating rows. In addition the editor buttons for both visual and HTML editor modes are clearer and easier to define. New theme: We’ve also got a new default theme, Twenty Eleven, which looks pretty nice (I didn’t even realise what it was when I chose it for the Grass Snake Union Band website). Go faster stripes: Apparently we should see marked improvements in speed for the admin area, but I haven’t really used it for long enough to get a good idea of how much improved it is. F$&k you IE6: And good riddance I say! WordPress is no longer supporting IE6. I assume this means that it may still work in IE6 but the development team are no longer bug checking for IE6 and we could soon find it unusable in IE6. Stats on IE6 usage show that it’s dropped hugely in recent times. Visiting the admin area with IE6 will present a message via Browse Happy.